Between the Door and the Street grew out of a series of wide-ranging conversations between Lacy and a group of activist women in New York City, held over the course of five months. Lacy considered this preparatory work to be a key part of the project as a whole. The ideas, expertise and principles from these conversations and an advisory board of 20 women led the collaboration. 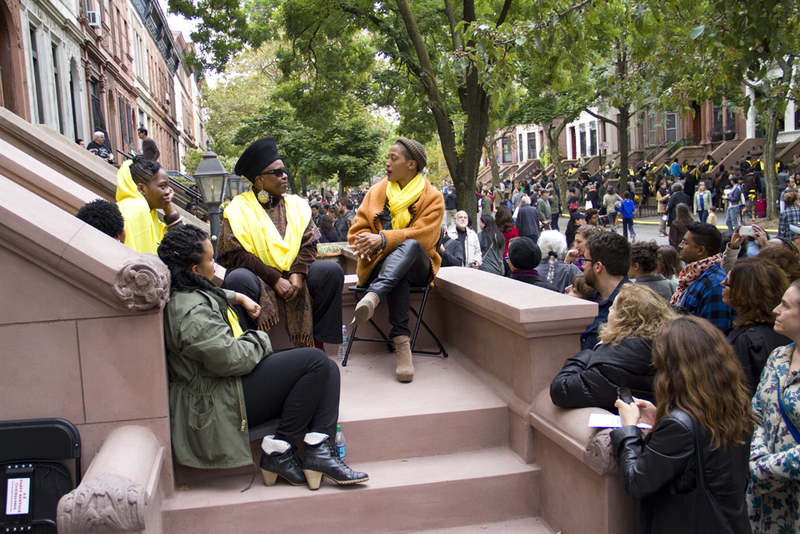 After engaging almost 400 women and a few men from activist organizations in a lengthy preparation period, the final performance took place on 60 stoops in a Brooklyn neighborhood and reflected the region’s vast diversity. An estimated 2500 people entered the closed-off street through a sound installation by Bruno Louchouarn. Along the length of the street the constellation of groups of people on each porch, emphasized by a sweeping yellow line on the street curbs and punctuated with yellow potted flowers, with performers wrapped in yellow pashminas, resolved into distinctly individual groups with their own topics. Conversations were unscripted but choreographed from questions forwarded by each group, revealing the extent of activist engagement on issues of gender, race, ethnicity and class. As the conversations drew to a close, tables were set up in the center of the street and residents offered hot refreshments, while Arooj Aftab sang over the continuing conversations of audience and performers. Produced by Jean Cooney with Jennifer Hsu. Curated by Nato Thompson, with Catherine Morris, sponsored by Creative Time and the Elizabeth A. Sackler Center for Feminist Art at the Brooklyn Museum, Brooklyn, New York.